An interesting LPE would be one with a 24 mm bore and 19 mm stroke. I have started development this past week on these parts. I hope this render will give you enough of an idea? If not, let me know! I'll post some more images then. You know what would be nice? A minifig-scale search and rescue ship propelled by a pneumatic V16. I do not have any prototypes as of now, however I could design a prototype in my free time. The idea is essentially to create Lego engine pieces that are smaller, which would of course mean that there are smaller axles as well to accommodate the tight spaces: a regular axle would be to big in diameter to use. And besides smaller Lego engine pieces, bigger ones that have piston sizes of a full 3 studs wide could allow for some interesting builds. Together with a special ship hull, you could use the larger pieces to pneumatically power a minifig scale cruise ship. The only you would need electricity for is to pump the air and control the valves for the rudder and throttle. Pretty cool in my opinion. I'll see what I can do with designing a prototype and I will get back to you when I have one. Hi @coaster, Sorry for my late reply. I know the feeling of always being occupied by other projects, take your time! Cheers! Wow, @ER0L those are some very stunning vehicles you got there! The locomotive even surpasses my standards of detail for the railings! I like what you did with the front with the chain element. Well, 7-Wide it is then. Thought about it this night so I decided 7-Wide would be better than 6-Wide because it would be narrower than my train designs and wider than my car designs. 7-Wide containers should not be a problem as I obviously have 8-Wide train designs haha. @deraven Thanks for the link! It certainly does give me inspiration. Gregory U. ---EDIT--- Oh forgot to ask but are those tires on the LTI truck custom? Gregory U. Hey @supertruper1988, Thanks for the link and I will definitely take a look at your building instructions! Really appreciate it! Gregory U. Hey there fellow LEGO fans, I don't really know where I should post this so here goes nothin'. I want to build myself a Semi but I am struggling to come up with a proper width. My trains are 8-Wide, my cars are 4, 5, or 6-Wide depending on the class. See the thing is that it is very hard to model with LEGO when your vehicle has an uneven width. I was thinking either 7-Wide or 6-Wide but 6-Wide would make some sports cars or bigger SUVs look really wide. So what do you recommend? Cheers, Gregory U. Hey @coaster, Thank you for welcoming me to EB! Glad to hear that this project is still alive and breathing. True that there is only so much time in a day and you have a company to manage as well. Not to mention that BrickTracks is the only company that makes custom track pieces the way LEGO makes them, by molding them which I really appreciate! Oh almost forgot, I don't mind that I would have to manually align these couplers, heck the railroads in our world also have to do that. Still, I am happy to hear this is not being abandoned. Good luck with your projects! Gregory U. Too bad I don't have the space for a layout big enough yet to accommodate the wider curve pieces. If all works out, I may move to a house that has a huge backyard and then I should be able to lay a good 1/4 Mile of LEGO track. 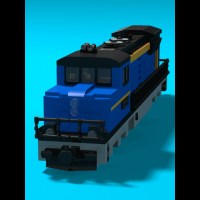 My trains will not be able to run on standard LEGO R40 curves due to me designing the couplers onto the frame of the locomotive or rolling stock instead of the way LEGO solves it by putting the couplers onto the bogies. Hey there @coaster, I am a first-time poster here on the Eurobricks forums. 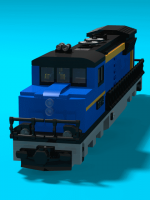 I am a huge fan of LEGO and American trains so I tend to design American trains for my own purposes. I am slowly growing dissatisfied with the good ol' magnet couplers from LEGO and so I was looking through the internet for custom couplers and I found this page. I have a question for you, will we be able to buy these couplers when they are done? If so, I would buy a 100 pieces of these to replace the magnets on my only running train and future trains I will build. Keep the great work up! I would find it very unfortunate if this great looking project would be abandoned. Gregory U.